The 20 Francs Francais gold coin was first minted by the French government in 1899 and since the first issuing, demand for this coin has been more than expected so the government continued issuing impressive quantities in order to satisfy the interest manifested by investor. The last year of minting was 1914 so it’s a coin accompanied by quite a history. The 20 Francs Francais gold coin presented on our website was minted in 1912. The purity in which is available a 20 Francs Francais gold coin is 90.00% or 900/1000 fineness and has a 21 mm diameter. It weighs 5.81 grams of pure gold, the equivalent of 0.1867 troy ounces of gold and the total weight is of 6.45 grams. The aforementioned characteristics are what attract investors to this bullion French gold coin. Collectors are fascinated by the French culture and by the beautiful and delicate design of this 20 Francs Francais gold coin. People are always fascinated by history and this coin is accompanied by the scent of an era known only from books. The reverse depicts the mighty and proud Gallic Rooster so representative for the France culture and illustrious historic past. The tail side of a 20 Francs Francais gold coin has a legend that presents itself in the following way: three famous words that have been known by every generation that followed those times in every corner of the world LIBERTE EGALITE FRATERNITE, the issuing year 1912 found at the bottom of the coin under the grass on which the rooster is engraved, and the denomination of 20 FCS also at the bottom of the 20 Francs Francais gold coin. The head side of a 20 Francs Francais gold coin has engraved a portrait that for French people symbolized reason and liberty, a word also inscribed on the reverse. The portrait belongs to Marianne and is facing right. REPUBLIQUE FRANCAISE is the only inscription alongside of the portrait. Some investors may consider that since the 20 Francs Francais gold coin benefited from an increased mintage it may not be as valuable as other coins when it comes to the evolution of their premium. However, with years there might not be so many France gold coins available and not all in perfect condition. Then their premium will increase becoming profitable. 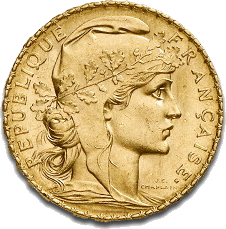 The price of a 20 Francs Francais gold coin is largely determined by the gold spot price. Investors can speculate on the evolution of the price for this precious metal and invest in gold bullion coins when the price is not so high, selling them afterwards at an increased price. Even since it was minted, the 20 Francs Francais gold coin was a bullion coin, therefore being addressed to investors. Another category of people for whom this coin was issued are collectors. What attracts people to this coin is its affordability so there should not be missed the opportunity of owning a 20 Francs Francais gold coin, which can be purchase from our website at a price free of VAT.